PRODUCT DESCRIPTION: New Maxforce® FC Magnum is the most powerful cockroach bait gel ever. Whether cockroaches eat it, touch it or share it, Maxforce FC Magnum kills more roaches faster than any other single product. There's no advance preparation required and no odor. 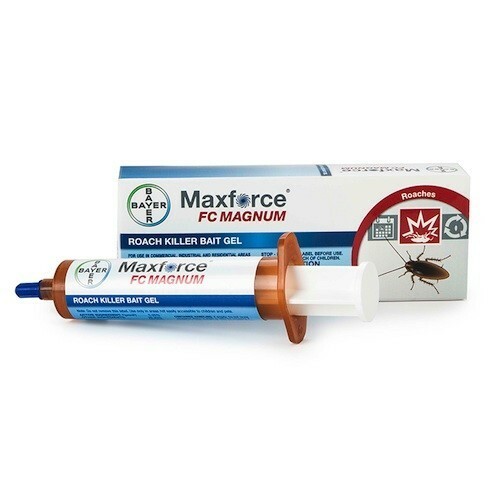 Maxforce Roach Killer Bait Gels has USDA authorization for use in federally inspected meat and poultry plants. What's more, you can use Maxforce Gel in residential food processing areas without covering food preparation surfaces during treatment. It's also fine to use in occupied rooms of hospitals, nursing homes and extended care facilities. WHERE TO USE IT: It is labeled for inside and outside. Very good product for use in cabinets and places where it is hard to treat with traditional sprays. Small dabs are made where roaches are being seen. They will find the Maxforce because it is formulated with attractants they love. Once they find it, they will eat it and die. In most cases, treatment can be done without having to remove everything from your cabinets or having to kick everyone out of the home. RATE OF APPLICATION: This varies with the level of infestation. Badly infested homes may take two or more tubes to get complete control. Ordinarily, one tube will last 6 to 12 months. Excellent info! Will order product Friday, thanks! I recently started renting a house we notice that the house is infested with roach I've done everything bombs gel traps nd it seems as if more nd more roaches r coming out why? The simple answer is because you haven't yet applied our products! And though this might seem like a biased answer, its actually true. Here's why. If you were to contact a local pest control server where you live and have them come out to treat, do you think they'd be using what you've applied? The answer is no. And why do they use something different? Well, for the most part, its because they know what works to control a local roach problem and you can rest assured its not what you can find at your local retail outlet! So if you want to get rid of roaches for good, you'll either need to hire a local company or get the products they use from us and do the work yourself. Its not that hard and if you follow our directions, you can definitely get control of the problem. We have helped many, many customers solve their roach problems and I'm sure you can get rid of them too. You just need to employ the right products. If you store it in a refrigerator, an open tube of gel will be good for at least a couple of years. But even at room temperature, it can degrade within a year. And if kept where its hot? The gel will get "runny" and the active can be negatively impacted as well.